Nothing is more elusive and mysterious than the wild mushroom. David Arora celebrates the gathering and study of wild mushrooms with engaging style, wit and simple terminology. 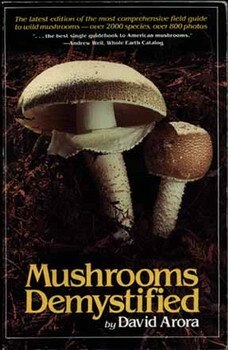 Mushrooms Demystified included descriptions, photographs, and keys to over 2,000 species. There is a Beginner's Checklist of the 70 most distinctive and common mushrooms plus detailed chapters on terminology, classification, habitats, mushroom cookery, mushroom toxins, and the meanings of scientific mushroom names. David Arora has taught mycology for the last 15 years in California and has hunted and photographed mushrooms across the continent. Beginners and experienced mushroom hunters everywhere will find Mushrooms Demystified a delightful, informative and eventually indispensable companion. "What more can one ask for? Thousands of species, keys, splendid illustrations, perceptive and engrossing text, sound advice on cooking and eating. ... The top of the line in single volume identification guides, and it will most likely remain so for your lifetime."